Save $10 on Playing Preschool from Busy Toddler! Susie, the creator of Busy Toddler is having a rare SALE on her popular at-home preschool activity eBooks Playing Preschool! Now through Sunday (4/14), you can get one Playing Preschool eBook (Year 1 or Year 2) for $29.90 (reg $39.90) or you can get the Playing Preschool Bundle Pack for $54.80 (reg $69.80)! If you are like me and always wondering what educational activities you could do at home with your toddler, Playing Preschool is for you! 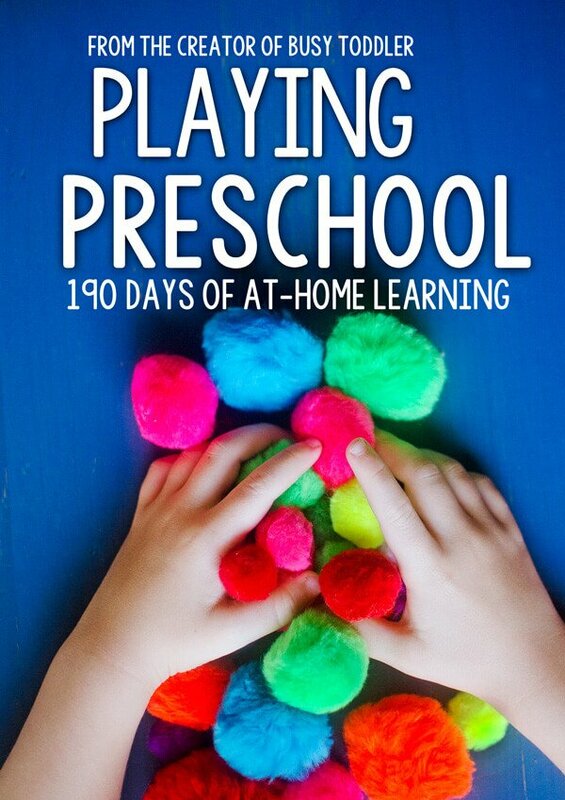 This eBook is full of ideas for hands-on play-based learning activities to do with your toddler. In fact, it has a curriculum of activities for 190 days (or 38 weeks) that explore reading, math, science, art, and more. All the activities take less than 45 minutes and most of the supplies are things you already have in your home (and any other supplies needed are easy to find and inexpensive). You can easily adapt it to fit your life and the time you have available. There are two Playing Preschool programs, Year One and Year Two. The Year One Program is designed for children ages 2.5 – 5 years old and the Year Two Program is a continuation of the previous year to expand your child’s thinking even more. Each year has 19 thematic units and each unit is 2 weeks long, so it comes out to 190 days of learning (38 weeks). For each day you’ll be given an introduction, a read-aloud picked to fit the theme, things to talk about, a learning activity done by parent and child, and an easy activity for your child to do independently. The activities are well organized and a lot of fun!